The LAT's field-of-view is very large and, while the LAT's effective area is much larger than earlier gamma-ray missions, the flux of astrophysical gamma rays is low enough that the detection of all but the strongest sources will require very long observations. Fermi's default observing plan is a survey mode where the LAT's pointing is offset 35 degrees from the zenith perpendicular to the orbital plane; once per orbit the pointing is rocked to the opposite side of the orbital plane. Between the rocking once per orbit and the ~55 day precession of the orbit, the sky is observed uniformly. Thus survey mode will satisfy the needs of most scientific investigations while the utility of pointed observations will usually be small, and the GI program is very unlikely to fill Fermi's observing plan with traditional pointed observations. The Fermi Users' Group (FUG) has studied the relative merits of pointed vs. survey mode observations, resulting in the white paper below. The issues raised in this white paper should be considered before planning pointed mode observations. A PDF version of this white paper is available for download here. To describe the typical observing patterns that we expect to perform with Fermi. That is, the typical durations and frequencies of the various different kinds of science observing modes. This document provides a basic summary of the plans that have been discussed in detail with the mission partners (instrument teams) and the science community (through the Users Group). It is important to remember that Fermi is a discovery mission, so flexibility is important. 1 The total amount of time in the pointed (scheduled) + pointed (ToO) observations should be 20% or less of the total observing time. The dominant observing mode of Fermi is expected to be survey mode. In this mode, the spacecraft undergoes a repeating pattern of slews about the velocity vector. Survey mode can be commanded either as a repeating pattern of 17 waypoints, or by issuing explicit slew commands. The primary goal of the default setting for survey mode is to provide the most uniform sky coverage over a short time (in other words, obtaining complete coverage of the sky in a few hours is better than waiting for a day before all parts are observed). A substantial fraction of high-energy gamma-ray sources are variable on timescales from hours to years. Survey mode maximizes our ability to study the behaviour of time variable sources anywhere in the sky over a wide range of timescales. The current concept for survey mode is to slew once per orbit, alternating between 35 degrees above and 35 degrees below the orbit plane. This provides gamma-ray observations of the entire sky every two orbits (~190 mins). This survey strategy may be refined and optimized before launch. During the course of the mission we may wish to change the survey mode settings, but this is not likely to be a common thing to do or done much by guest investigators. Survey mode observations will provide suitable data for most Fermi investigations. However, in certain circumstances we may wish to maximize coverage of a source during a specified period of time. This allows us to monitor the source to greater accuracy and to shorter timescales than would be possible in survey mode (but with significant impacts on the coverage of the rest of the sky). There are three types of pointed observations: scheduled, target of opportunity and autonomous repoints. A scheduled pointed observation is planned in advance of the observation. Pointed observations may be time-critical (for example, if the pointed observation is designed to coincide with an observation campaign involving several observatories). The duration of a scheduled pointed observation will typically be days to weeks (but may be longer or shorter than this). A secondary target will usually be selected for periods when the primary target is occulted by the Earth. The GSSC plan to either schedule a secondary target, or a short fragment of survey mode when the primary target is occulted. Thus, the spacecraft should not need to perform Earth avoidance maneuvers during scheduled pointed observations. A target of opportunity observation is an inertial pointed observation of a phenomenon discovered by Fermi, or by other observatories, that is interesting enough to interrupt planned Fermi observations. Apart from the manner in which it is scheduled, a ToO observation is similar to a scheduled pointed observation. A significant difference is that, unlike scheduled pointed observations, there will not be a secondary target so the observatory will perform an Earth avoidance maneuver when the target is occulted by the Earth. Like a scheduled pointed observation, the duration of a ToO observation will typically be days to weeks. Requests lasting longer than a couple of days will become scheduled pointed observations in the next ATS command load. The frequency of ToO observations is expected to be a few times per year. An ARR observation occurs when the spacecraft autonomously slews to and performs an inertial pointed observation at the location of a gamma-ray burst detected onboard the LAT or GBM which meets pre-defined criteria. The current plan is for an ARR observation to last for five hours. During the time that the GRB is occulted by the Earth, the observatory will perform an Earth avoidance maneuver to keep the Earth out of the LAT field of view. Initially, the criteria to determine whether to request an ARR will be set so that the frequency is around once per week for GRB which trigger within the LAT field of view and around once per month for GRB which trigger outside the LAT field of view. Currently, these thresholds for GBM detected bursts are implemented in GBM FSW and the thresholds for LAT-detected bursts are implemented in LAT FSW. Since the GBM is likely to generate a significantly higher rate of ARRs than the LAT, adjusting the rate of ARRs may only require an update to GBM flight software. The frequency of ARRs is relatively high. There may be times when we are performing time critical observations (which could be survey, pointed or ToO mode) where we wish to either raise the threshold for an ARR, or switch them off altogether. The former reduces the likelihood of the observation being interrupted by an ARR while still allowing the possibility of an ARR observation should an ÒextraordinaryÓ burst occur. The default observing mode in year 1 will be survey mode. ARRs will be switched on (at the rates described in section 2.2.3). Except in exceptional circumstances, there will be no ToO or scheduled pointed observations. In later years of the mission, it is likely that the default observing mode will be survey mode. However, there will be some ToO and inertially pointed observations (driven by guest investigator proposals). The current recommendation from the Fermi users committee is that >70% of the time will be spent in survey mode (including ARRs). Up to 20% of the time is available for ToOs and scheduled pointed observations. This means that we might typically in a year have 281 days in survey mode, 11 days (in 5 hour chunks) in ARR and 73 days in pointed observations. If the typical duration for scheduled pointed or ToO observations is one week, then there would be around 10 pointed observations per year. It is useful to consider some of the potential science motivations for pointed observations. The first year will be spent primarily in survey mode. This means that all locations in the sky will have collected substantial exposure. A pointed observation will need a fairly long exposure time (~3 months) to equal the flux detection sensitivity achieved from the year of survey mode observations. Thus, pointed observations are likely to only be advantageous for time critical phenomena. These fall into two broad categories; (a) observations to maximize exposure during a specified time period and (b) observations to maximize coverage of a source. These are considered in more detail below. There will be cases where it will be advantageous to maximize the sensitivity within a fixed time period, i.e. where the sensitivity over short integration times is important. Resolve rapid, low-amplitude flares in AGN. Pointed observations may also help to extend the structure function of selected AGN to shorter timescales. When we are interested in timescales that are short with respect to the sampling time in survey mode (~3 hours), we may want to maximize the amount of time that the target stays within the LAT field of view. This will include observations of GRB afterglows (which are accommodated by ARR observations) and binary systems near periastron (e.g. PSR B 1959-63, where there is a specific time where we expect something interesting might happen). The impact of a pointed observation is likely to be substantial. There will be degradation of all-sky monitoring for the duration of the pointed observation. This could have a significant impact on multiwavelength campaigns that may depend on getting survey mode observations. The introduction of non-uniformities in temporal sampling might result in artifacts or reduction of sensitivity for higher level derived variability products such as structure function analysis etc. A pointed observation will cause non-uniformity in sky coverage which could introduce biases or difficulties for population studies with LAT sources. Finally, an ARR or ToO observation causes the observatory to be pointed in a different direction than that used for generating the planned timeline, This means that we may miss a previous scheduled TDRSS contact because the Fermi Ku band antennae no longer has visibility to the scheduled TDRSS satellite. This would increase science data latency by 3 to 6 hours for around 50% of ToO and ARR observations. In order to illustrate the relative advantages and disadvantages between survey and pointed observation modes, we consider the exposure uniformity for a couple of realistic observation scenarios. The first examines the effect of GRB afterglow observations and the second considers a 55 day pointed observation. The simulations assumed a circular orbit with 565 km average altitude and 28.5 degree inclination (note that it is likely that we will use the excess lift capacity to lower the inclination to 25.4 degrees). This results in a ~96.5 min orbit period and ~55 day precession period. The Earth avoidance angle (minimum angle between the Earths limb and the center of the LAT FoV) was set to 30 degrees. We note that in general it is not possible to have a continuous monitoring of a source due to the SAA and to occultation by the Earth. We considered the effect of autonomous GRB repoint observations, we chose a day containing two pointed observations each lasting 5 hours. If the autonomous repoint rate is set to ~1/week then this will probably happen a few times per year. The two pointed observations were at ra, dec of 100, 60 and 30, 10 at 6000s and 40000 s respectively. Figure 1 shows exposure (in arbitrary units) for a day-long observation in survey mode (right) and survey mode with the two 5 hours pointed observations. In addition to exposure uniformity spatially across the sky, we also looked at the effect of the 5 hour pointed observations on uniformity as a function of time at selected locations. Figures 2, 3 and 4 show the effect of the two ARRs on the exposure as a function of time at the locations of Mrk 421, Mrk 501 and PKS 1622-29. 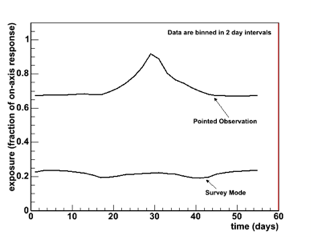 Figure 1: The exposure for a day-long pointed observation in pure survey mode (right) and survey mode interrupted by two 5 hour pointed observations. 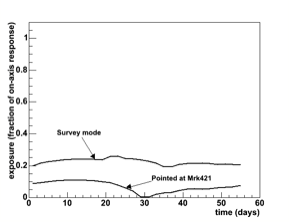 Figure 2: Exposure as a function of time at the location of Mrk421 for a day in survey mode (left) and a day in survey mode interrupted by two 5 hour pointed observations. Figure 3: Exposure as a function of time at the location of Mrk 501 for a day in survey mode (left) and a day in survey mode interrupted by two 5 hour pointed observations. Figure 4: Exposure as a function of time at the location of PKS 1622-29 for a day in survey mode (left) and a day in survey mode interrupted by two 5 hour pointed observations. Both of the pointed observations were in the northern hemisphere, so the exposure on this southern hemisphere source is significantly reduced. We considered a 55 day pointed observation of Mrk421. We evaluated the improvement of exposure at the location of Mrk421 and the impact the effects of the pointed observation at the location of Mrk501 and PKS 1622-29. Figure 5: Exposure at the location of Mrk421 increases by a factor of ~3.5 relative to what would have been achieved in survey mode. However, a large fraction of the sky loses more than a factor of 3 relative to survey mode. As in the previous case, it is useful to consider the exposure history as a function of time at a few representative locations in the sky. Figure 6 show the exposure at the location of Mrk421 for a 55 day observation in pointed mode and in survey mode. Each point in this plot is the exposure integrated over a 2-day interval expressed as a fraction of the unocculted on-axis exposure. Figures 7 and 8 show the exposure at the location of Mrk501 and at PKS 1622-29 for the 55 day observation of Mrk421 (in pointed and survey mode). Mrk501 lies at the edge of FoV when the LAT is pointed at Mrk421 and thus there is a small gain in exposure for the pointed observation compared with survey mode. In the case of PKS 1622-29 things look quite different as this source does not lie within the LAT FoV for a pointed observation of Mrk421. The Earth avoidance maneuver serves as a partial sky survey and fills in some of the sky. For most of the precession period this means that PKS 1622-29 will get some exposure. During the period where the LAT is continuously pointed at Mrk421, PKS 1622-29 receives no exposure at all. 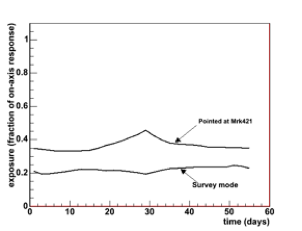 Figure 6: The exposure at the location of Mrk421 for a 55 day observation in pointed mode, and survey mode. A pointed observations typically gains about a factor of 3 in exposure (a factor of ~1.7 in sensitivity for background limited observations) for most of the precession period. Mrk421 is continuously visible (except for SAA outages) for a few days in each precession period. Figure 7: Exposure as a function of time at the location of Mrk501 for a 55 day observation with the LAT pointed at Mrk421. Mrk501 lies within the FoV of the LAT for during a pointed observation of Mrk421. Figure 8: The exposure as a function of time at the location of PKS 1622-29 for a 55 day observation of Mrk421 in pointed and survey mode. The benefit of a pointed observation is best illustrated in Figure 6 which shows that a pointed observation will typically provide around a factor of 3 increase in exposure, increases in exposure of up to a factor of 5 are possible for short durations (for times when the target can be continuously observed without occultation by the Earth). For observations which are limited by background this will result in an improvement in sensitivity of a factor of sqrt(3) = 1.7. In cases where the sensitivity is limited by the ability to collect enough photons (i.e. short duration or high energies) the improvement in sensitivity will be a factor of 3. For pulsation searches where the limitation is the behavior of the pulsar the improvement could be much larger than a factor of 3. However, it is very hard to know how much improvement you will get a priori, especially since the pulsar and its properties are as yet unknown! For long duration observations (> 1 day) the improvement in sensitivity is relatively modest and the impact on observations of the rest of the sky is quite substantial. For short duration observations, the relative improvement in sensitivity is greater and the impact on observations of the rest of the sky is less severe. We anticipate that, with the exception of GRB afterglow observations (which last a few hours), the need for pointed observations based on sensitivity alone will be relatively rare. An important point about using pointed observations for blind pulsar searches is that is is wasteful to do those observations early in the mission since we don't know the behaviour of the unknown pulsars that are out there. It is possible that many of them will behave 'nicely' or be strong enough such that they can be blindly detected using survey mode observations. We certainly wouldn't want to hurt other science by dropping survey mode for pointing at those sources. Therefore, pointing for pulsar searches only really makes sense after all of the easy ones have been found using survey mode observations (say after 2 years or so), and there are highly likely pulsar targets that people are willing go after given the cost of slightly damaging the survey observations of the rest of the sky.